For the deep-sea jellyfish in Splatoon 2's Octo Expansion, see denizens of the deep. A Jellyfish in Inkopolis Plaza. Jellyfish are creatures found in Splatoon. They can be observed walking around Inkopolis Plaza wearing various articles of clothing. They are the second-most common creature in the city, but most do not speak Inkling and cannot be interacted with. Like Inklings in the Plaza, however, they can be pushed around slightly and will turn to look at the player when they approach. 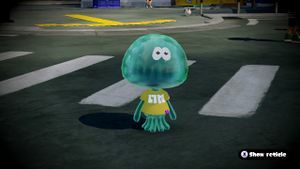 Unlike Inklings, jellyfish look fairly similar to their aquatic counterparts, with the most significant change being that their bodies have taken on a more humanoid shape. They have large, round heads, with their only facial features being a pair of very close-set eyes with diamond-shaped pupils and no visible irises. They have a pair of upper tentacles that serve as their arms, and a ring of eight lower tentacles that serve as legs. A jellyfish can stretch their "arm" tentacles to several times their body length at will. A jellyfish wearing a Team Naughty Splatfest Tee. Being quite gelatinous, jellyfish noticeably jiggle when they move. Through their translucent skin, squishy innards can be seen. Greenish-blue skin seems to be uniform across the species, with the exception of Jelonzo and Jelfonzo. Jelonzo's skin is sky blue with a slight purple tinge in some areas, and Jelfonzo's is a slightly paler blue with a stronger purple tinge. In Splatoon 2, jellyfish change color to match that of their team during a Splatfest. A jellyfish with orange skin to match their Splatfest team in Splatoon 2. Though jellyfish have been shown to wear a variety of clothing, most only wear a t-shirt. Many of their shirts are smaller versions of clothing items available to players, such as the Pirate-Stripe Tee and the Black Squideye. During a Splatfest, all jellyfish in Inkopolis Plaza or Inkopolis Square wear a Splatfest Tee in support of their chosen team. However, their version of the shirt lacks the wristband, as they have no wrist to wear it on. In Splatoon 2, some Jellyfish wear sleeveless Splatfest Tees, a style unavailable to players. Jellyfish are capable of giving off light, possibly from bioluminescence, an ability some real-life jellyfish such as the crystal jelly possess. Jelonzo appears to glow slightly, which has been confirmed by Callie; she often mistakes him for a "glowing ghost", as seen in one of her comments on Bluefin Depot. All jellyfish in Inkopolis Plaza give off a faint green glow during a Splatfest, seen only on the ground below them. While most jellyfish have never been heard speaking, Jelonzo's voice is heard when he speaks to the player. It is somewhat high, being close in pitch to Annie's, but louder and clearer. It is possible that other jellyfish have a similar voice. Jellyfish apparently reproduce by splitting off of one another; Live from Squid Research Lab has stated Jelfonzo split off from Jelonzo. This resembles the reproduction of real-life jellyfish, which spawn daily given enough food and sunlight. Hisashi Nogami, producer of the Splatoon series, suggested in an interview that jellyfish individuals are part of a hive mind. To give an example, he states that jellyfish couples are not actually in love but want to imitate the behavior of those in a relationship. Jelonzo is a blue jellyfish that owns Jelly Fresh, a clothing store in Inkopolis. He is the only jellyfish in Splatoon who can be interacted with. While little is known about DJ Lee Fish, their name seems to suggest that they are a jellyfish. They are a musician; four variants of their song Lookin' Fresh are heard in the shops of Booyah Base. Jelfonzo is the owner of Ye Olde Cloth Shoppe in Splatoon 2 and the only jellyfish in the game that can be interacted with. He learned Inkling from old books, which caused him to learn outdated words and grammar. He split off of Jelonzo, which, as stated by Live from Squid Research Lab, makes him Jelonzo's son. Jellyfish do not appear in Ranked Battles in Splatoon. Jellyfish working in Inkopolis Tower. 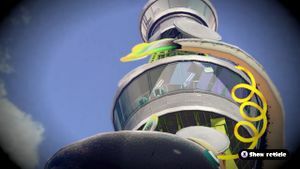 Two jellyfish operate the air traffic control center above Inkopolis Tower. Jellyfish stroll around the plaza, wearing different pieces of clothing. Some jellyfish can be found sitting on benches, both inside and outside the Plaza. Below the Inkopolis News Studio, a jellyfish can sometimes be seen dancing beside a pillar. A jellyfish often stands at the train station behind the Plaza. Four jellyfish can be found standing near a tree outside the Plaza. During a Splatfest, jellyfish congregate in front of the Squid Sisters' trucks, wearing Splatfest Tees and dancing to the music. Some Jellyfish can be seen cheering from behind the secret alley windows. 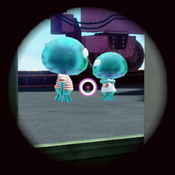 Outside the stage's boundaries, jellyfish can be seen walking around and spectating the current battle from the warehouse's large windows. 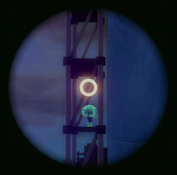 Jellyfish often stand on the towers surrounding the map, either alone or in pairs. Some of them dance. Many Jellyfish can be seen behind the shop windows watching the battle. Some Jellyfish can be seen outside the skatepark. A pair of differently-sized jellyfish talking at Port Mackerel. Behind the glass forming the boundary of the Stage, a jellyfish can sometimes be seen directing a forklift. Also behind the glass, a pair of jellyfish can sometimes be seen talking to each other. One is smaller than the other; it may be a younger jellyfish or simply a short one. Outside the boundary of the Stage, a few jellyfish, possibly workers for the greenhouse, can be seen. A lone jellyfish at Bluefin Depot stretching out their tentacle. 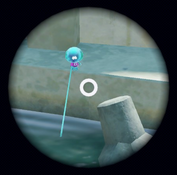 Across the water, outside the bounds of the Stage, there is a lone jellyfish which can only be seen up close by zooming in with a scoped Charger. It is not always there, but when it is, it either sits peacefully by the edge or stands and stretches their tentacle into the water. On the opposite side, along the wall of Miiverse posts, there are sometimes a few jellyfish standing or sitting around. Some of them seem to be spray painting the wall. There are four jellyfish next to the ramp on each side of the stage, standing next to a car inside a parking lot. A couple of jellyfish can be seen doing construction work on some scaffolding on a nearby tower. Jellyfish can be seen across the lake at Camp Jellyfish. A jellyfish can be seen hopping around in a canoe. Other jellyfish tend to stand on the Camp Jellyfish fort. One or two jellyfish at Camp Jellyfish can sometimes be seen crouching by the water and noticeably vibrating. The reason for this is unknown, and it is not seen in any other location. A jellyfish dancing on a balcony at Flounder Heights. Jellyfish appear to live in Flounder Heights, and can be seen performing daily activities there. Two jellyfish can be seen behind each glass door. One appears to be dancing and cheering on battling Inklings, while the other stands with a tentacle on their "hip." A group of jellyfish play at the nearby playground. 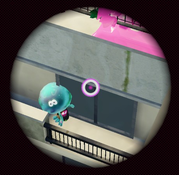 There are two balconies on either side of each team's Spawn Point, with a single jellyfish on each one. One of them is usually dancing. During a Splatfest, with the lights in the apartments on, silhouettes of jellyfish can be seen in some of the windows. Several Jellyfish can be seen dancing or sitting down on the top railings of the bridge. One is saving another jellyfish from falling into the water by using their tentacle. Several jellyfish can be seen painting inside a studio outside the stage's boundaries. These jellyfish were shown in the 12 November 2015 Nintendo Direct. Some jellyfish in red berets and smocks usually stroll around inside an inaccessible portion of the museum. There are countless paintings and sculptures of jellyfish scattered throughout the stage. A jellyfish construction worker at Moray Towers during a Splatfest. A few jellyfish sit in inner tubes and lie on inflatable rafts on the water. Some jellyfish (along with horseshoe crabs) lie on chairs and towels by the poolside; others simply walk around. Some jellyfish can be seen playing volleyball. A jellyfish wedding can be seen in the distance. A jellyfish stands in a raft floating on the surrounding water. A worker jellyfish waves at the Pit from a small platform with a tent and a couple of weapons. Three jellyfish are tightrope walking on top of the stage. One appears to be falling off. Within the stage boundaries, jellyfish are seen working at computers in small rooms behind glass doors. There are a total of six, with two in the central area and two near each Spawn Point. Many jellyfish sit at the tables of the cafeteria below, with a few wandering around. However, unlike the ones within the stage itself, they are flat, static images instead of animated 3D models. There is also a room filled with jellyfish, possibly a meeting. Up high, on the ship's masts, jellyfish can be seen balancing themselves and walking around. Two jellyfish can be seen skipping around on overlooks on the stage. A number of jellyfish can be seen on the shore, left of the stage from Team Bravo's spawn. Four can be seen sitting in benches in pairs, three can be seen inside a building, two can be seen on the walkway leading up to the ship, and five more can be seen spaced out throughout the rest of the shore. An unusually fat jellyfish talking to a regular-sized jellyfish at MakoMart during the Pancake vs. Waffle Splatfest. Off to the right side of Team Bravo's spawn, what appears to be a deli can be seen, with two jellyfish behind the counter, another jellyfish operating the cash register, and three jellyfish standing in line. One of the jellyfish in line is unusually fat. A similar deli exists near Team Alpha's spawn, with two more jellyfish behind counters. However, there is no jellyfish operating the cash register, and no line. Two jellyfish can be seen operating check-out lines. One small jellyfish can be seen stuck inside a crate containing large, rubber balls. One jellyfish employee is running a help desk at the back-right corner. Four more jellyfish employees can be seen around the store. One is advertising fruit, one is pushing around a shopping cart, one is talking to another jellyfish customer near the doors, and one can be seen at the back, stocking shelves. Two jellyfish can be seen having a conversation, with a small jellyfish in between them. In the store's aisles, to the left of Team Bravo's spawn, two jellyfish are seen pushing shopping carts. One jellyfish seems to be comparing two boxes of cereal, with a smaller jellyfish, presumably their child, jumping excitedly. Two jellyfish can be seen having a conversation near the soda aisle, with another small jellyfish jumping nearby. A fat jellyfish can be seen standing in the middle of the aisles, occasionally wiping sweat off their forehead. Near the Team Alpha deli, an employee can be seen talking to a much smaller jellyfish. A number of jellyfish can be seen riding the roller coaster together. The shops around the stage are occupied by jellyfish. 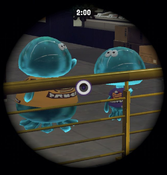 Two jellyfish occupy the shops closest to the spawn areas, the one to the left of the center, relative to Team Bravo, contains two more, while the one right of center contains three. The ride in the center of the stage is being ridden by three jellyfish. One of the rockets remains unoccupied. A carousel off to the stage's side is being ridden by three jellyfish. Various booths behind Team Alpha's spawn have one jellyfish apiece. The death drop ride is occupied by three visible jellyfish. A number of jellyfish can be seen riding the Ferris wheel. A single jellyfish can be seen walking around the docks at the side of the stage, taking in the views. A jellyfish can be seen on a unicycle juggling bowling pins, surrounded by a number of other jellyfish watching. Jellyfish are featured in all of the Arcade Games. By assuming squid form the player can clip through the jellyfish in Inkopolis Plaza. The same can also be done to Inkling's legs. Jellyfish may have large sums of money, given that they are often seen in cars, can afford to live at the expensive Flounder Heights, and that Camp Jellyfish seems to be significantly larger and more elaborate than Camp Triggerfish. Jellyfish make soft squishy sounds when they move or shake their heads. This can be heard via Recon and with Jelonzo in Jelly Fresh. Jelonzo's "BLUUH" may be an onomatopoeia referencing these sounds. Many Jellyfish participate in Splatfest to some extent, as they can be seen wearing tee shirts of the team the support. However, it is unknown how involved they are in Splatfests as they can not compete in Turf Wars. In Splatoon 2,different coloured jellyfish can be seen in Inkopolis Square during Splatfest, such as green jellyfish during the Flight vs. Invisibility Splatfest. Jellyfish do not seem to be bothered by water, as they are seen in it at Mahi-Mahi Resort and near it in Camp Jellyfish. This would suggest that they do not dissolve in water like Inklings do. Jellyfish can be seen in every multiplayer stage as well as Inkopolis Plaza and Inkopolis Square. The developers suggested that jellyfish might be the sponsers for the Turf War industry. Jellyfish didn't appear in Ranked Battles in Splatoon, but do in Splatoon 2. The developers mentioned that the in-universe reason for that is because the jellyfish have started to take an interest in these competitive sports, whereas before, Ranked Battles used to just be underground battles. It is said by Marina that it is a typical Jellyfish thing to never take a day off, mentioning that Jelfonzo and the staff at The Shoal are the same way.